Tarazod Films & Media LLC: Milwaukee Audience packs house to see Mad City Chickens! Milwaukee Audience packs house to see Mad City Chickens! 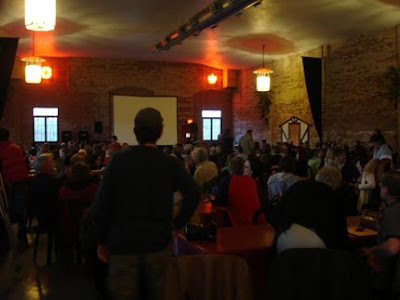 Last night over 300 people filled the Lakefront Brewery’s Palm Gardens to see the Milwaukee premiere of Mad City Chickens. It’s still illegal to keep poultry within city limits, but Milwaukee residents are ready for change, and they were ready for this film. As filmmakers, there’s nothing more rewarding than to experience a room full of people “getting” your film. And the Milwaukee crowd got it! They laughed, they cheered, and they want their chickens. For us, the adrenaline still hasn’t worn off. Read the Milwaukee Journal coverage by reporter Karen Herzog.